Visitors of the ABB booth at Hannover Messe this week were presented an extensive overview of the breadth, power and impact on efficiencies of today’s digital transformation. They were able to experience first-hand how the new ABB is writing the future of industry, energy, mobility, cities and work with its pioneering technology in digital industries. The factory of the future, the world's fastest e-vehicle charger and ABB Ability™ digital solutions were among the many displays at the ABB exhibit, while an ABB industrial robot was a dance partner on stage at the opening ceremony of the event. 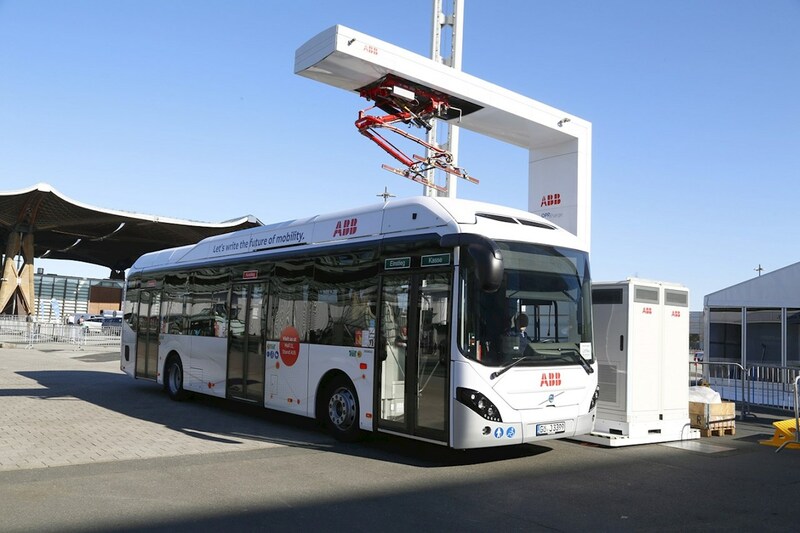 Delegates including German Chancellor Angela Merkel and Swedish Prime Minister Stefan Löfven experienced electric transportation in action in the fair’s first sustainable Volvo hybrid electric bus shuttle service, which was powered by ABB’s high-power 300PD OppCharge chargers. At the ABB booth CEO Ulrich Spiesshofer and Hans-Georg Krabbe, country manager of ABB Germany showed dignitaries, including EU-commissioner Günther H. Oettinger, how iconic, collaborative two-armed YuMi® robots together with a single-armed YuMi® put together wristwatches individually with unparalleled precision in the factory of the future. The evolutionary versatile transport system from ABB’s newly formed Robotics & Discrete Automation business was used to orchestrate the timely movement of parts from stations. Underscoring its leading role in writing the future of energy, ABB demonstrated the concept of a solid-state circuit breaker that will enhance performance of renewable energy solutions, industrial battery storage solutions and so-called edge grids. With the innovative technology, power losses are 70 percent lower than comparable solutions, enabling savings of up to $200,000 in a ferry and up to $1 million in a cruise liner over a ten-year period. With the new device, today’s electrical grids will be better able to keep up with the rapid growth of renewable energy solutions and the shift towards the electrification of transport – whether that’s electric cars, buses, trucks or maritime vessels – because they will be able to better and more quickly meet new demanding requirements. 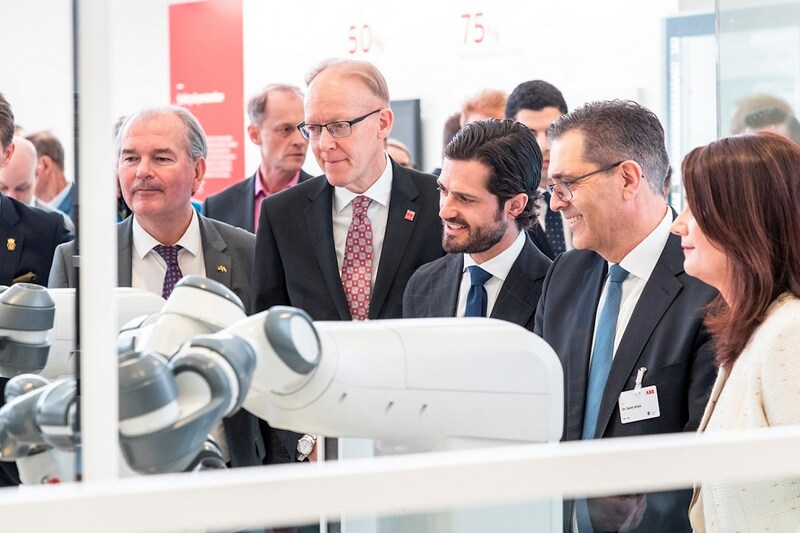 The visit of Sweden’s HRH Carl Philip, who was welcomed by Sami Atiya, President Robotics & Discrete Automation; Frank Duggan, President Region Europe and Johan Söderström, Country Manager ABB Sweden, underlined ABB’s strong connection with this year’s partner country of Hannover Messe. With its long history with Sweden, ABB had a significant presence at the Swedish Pavilion, showing world leading smart industry solutions and the country’s role as a greenhouse for co-creation and innovation, partnering with Swedish companies including Ericsson, Tetra Pak, SKF and Combient. ABB’s connection with Sweden goes back more than 130 years to ASEA, one of the founding companies of ABB, and that relation will go on for many years, said Johan Söderström. “Sweden has committed to the ambitious target to become CO2 free by 2045. Everything we do at ABB has that underlying factor. We want to contribute to a fossil-free and CO2 free world and that is something in the DNA of the Swedish companies,” he said, adding that Sweden is a powerhouse of innovation. ABB and Swedish technology firm Ericsson strengthened their long-standing relationship with the signing of a Memorandum of Understanding (MoU) at the fair, enhancing their joint vision for the future of flexible production with advanced automation and wireless communication. “With this MoU, we strengthen our partnership to accelerate the industrial ecosystem and realize the full potential of flexible automation, unlocking new business opportunities enabled by combining 5G and Industry 4.0,” Börje Ekholm, President and CEO, Ericsson said at the signing ceremony. The fifth generation of wireless technology, following 4G, promises vastly more bandwidth, near-real-time latency and operating across telecommunication bands. 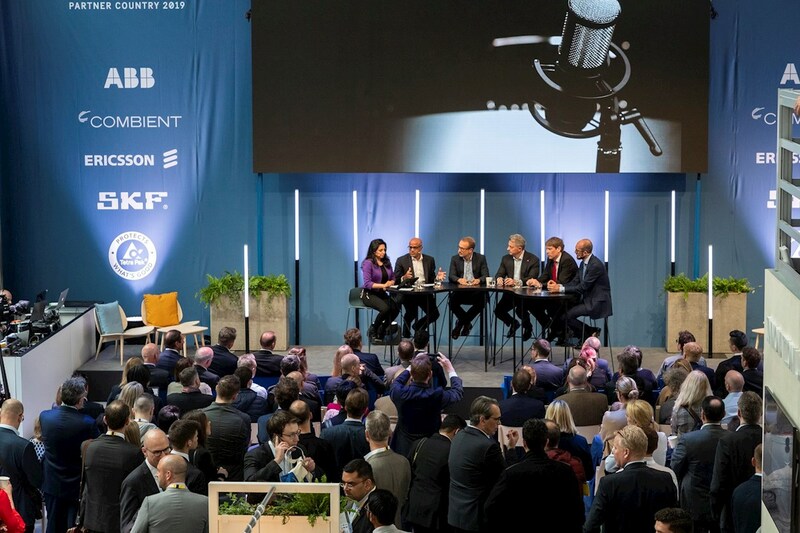 “Being able to connect products and machines within factories, oil pipelines and autonomous mining vehicles to help improve efficiency and asset health through 5G will bring benefits quickly,” ABB’s Chief Digital Officer Guido Jouret said during a panel discussion at the event. 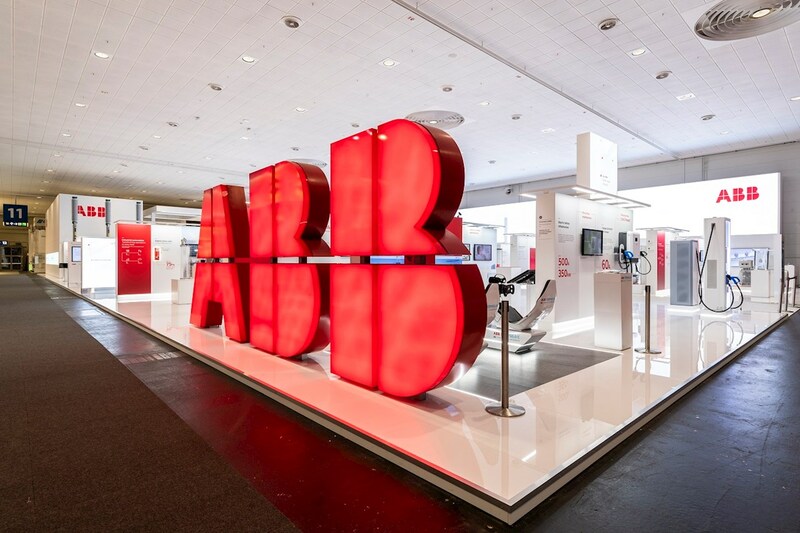 ABB used the trade show also to present its new structure and focus. The new ABB intensifies its emphasis on customers by simplifying its organizational structure to focus on four entrepreneurial businesses: Electrification, Industrial Automation, Motion, Robotics and Discrete Automation. This was also the opportunity for Tarak Mehta, President Electrification; Peter Terwiesch, President Industrial Automation; Morten Wierod, President Motion and Sami Atiya, President Robotics & Discrete Automation, to showcase the groundbreaking collaboration and digitalization technologies that are at the heart of ABB’s transformation as a leader focused in digital industries. On display were collaborative automation and digitalization technologies that are driving the next phase of the Fourth Industrial and Energy Revolution. As the pioneering technology leader in digital industries, ABB's deep domain expertise and the innovative ABB Ability™ offering of digital solutions and services are enabling customers to achieve new levels of flexibility, efficiency and performance. ABB's world-class research and development in autonomous systems and industrial artificial intelligence will drive the digital transformation into the future. Customers were excited about the breadth of digital solutions, that was combined with ABB’s installed base in all businesses as well as the range of sustainable and environment-friendly products that were on display. Partnerships and co-creation were another big topic in ABB’s activities. ABB has partnerships with leading digital global companies, such as Microsoft, Hewlett-Packard Enterprise (HPE), IBM and Dassault Systèmes to accelerate digital transformation and enable customers to unlock the unprecedented improvements in performance and productivity that digitalization delivers. ABB and Dassault Systèmes showed digital twin and factory modeling solutions, only weeks after the announcement of the partnership in February. Solutions on display included a digital twin model of a complete factory and an ABB RobotStudio demonstration of a digital twin application for a spot-welding robot. Digital twin technology enables operators to monitor and optimize production in real-time, while running virtual simulations of future scenarios.